Every year many thousand technocrats choose Java careers across the globe,after formally taking Java training classes,courses and/or Java certifications like OCJP etc.While appearing for technical interviews,these budding Java programmers face variety of technical questions, are asked to write code snippets to prove their mettle in relevant topics of Java.They are not only assessed on language basics but also on their familiarity with Java development tools, coding standards and guidelines,optimization of Java code,load tests,securing code through Java obfuscation and many more. It is their performance in these interviews which decides their career fate and is highly dependent on to-the-point and not too verbose answers. Apart from technical questions, an interviewee faces a spate of personal questions as well.In post, Personal Interview Questions you will find variety of questions asked on personal front.In wired world, it is very important to know where your resources are lying and how credible are they. This blog intends to provide a consolidated knowledge base for all netizens,budding Java Engineers or experienced ones, interested in Java technology.This blog will primarily focus on 'Core Java' related questions and later on advanced topics in Java EE space,Open source technologies and frameworks and more.At this point this is a nice idea to put a roadmap right away to put all these questions in an organized fashion. In order to access questions list on a particular topic,please click the links associated with it.It will open the questions list in the same browser window and in order to comeback to this page, while going through various posts, you have to click back button in your bowser window.Each answer for a question on various topics will open in a fresh window,while you are through with reading an answer,close the open window in order to comeback to the questions list.If you want to access Master List of Core Java Interview Questions then click here. 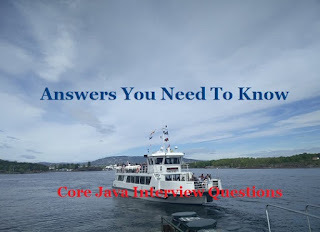 Check more miscellaneous short questions on Core Java with short answers,here. If you starve for more knowledge on Core Java,you may like to check out online e-books and other resources on Core Java or access all Online Java and Java EE resources. All suggestions,comments are welcome in order to make this space more productive and useful for all its audiences. That's a very interesting take on a blog idea! My hat is off to you. I'm a Java guy myself and am actually in the market right now. I get a kick out of some of the questions I get asked at interviews. My best story is that I worked for a place at which I wrote a technical exam for placement and then left the company. After a year (for whatever stupid reason) I came crawling back to the company for a job. They actually gave me the test that I wrote! Oh well. I need a wireless data collection tool that will enable me to make custom forms on my Blackberry or Motorola phone. The form need to support drop down menus, wireless inspection form, check boxes, GPS, bar coding and photo capture. Does anyone know of a product or service that can support wireless data collection like this? I have been working in mortgage industry for about 5 years and we found a solution that does this. We use it for wireless bar code reading and GPS tracking. The best part is we can customize the forms on-the-fly which saves us a lot of time over a customized solution. The company that makes the product is Westlake out of LA I think. There website is www.westlakesoftware.com. Their product is call AirMobility.net. They made a custom Extranet for us for our company to use but their main product site is www.airmobility.net. We found this service set up to make it pretty easy for us to migrate the information to our back office system. We use the technology and route it to 40 different servers nationally; has worked flawlessly for about three years. Customer service is really nice, just contact them, im sure they can help you out. While a list of technical questions certainly has value, and I do appreciate the effort and intention behind it, there is another level to technical staffing and hiring that many people, both candidates and employers often overlook. The purely technical focus, especially on a single language or set of tools, is quite misguided. Languages change; new ones come along; tool change even faster. More importantly, the types of applications being built change, the types of problems being addressed change. Learning 'answers' does not prepare one for true software development. Yes, one needs to know some language skill. But mostly this is transferrable. Sometimes experience in a more limited environment, which forces one to be creative and build one's own tools and infrastructure, is far more significant experience, and readily transferrable to new contexts. I have been both a programmer and manager of programmers; have applied for jobs and hired people. Once I hired someone whose immediate background was using vbscript in an .asp environment, which was not even close to what my organization was using. However, the candidate described how he imposed coding conventions and discipline to create object like constructs, built his own testing harness and procedures, and generally brought a fairly sophisticated approach to a fairly klunky and ad hoc technical and business environment. I did drill in to detail to verify that he could back this up. He also demonstrated genuine intellectual curiosity and drive, and I hired him based on these things, despite the fact that he did not match the 'requirements' in the HR job description. He quickly learned our environment and quickly outperformed other programmers who were too set in their ways. It's not always about 'what is the 14th argument to GetFooInfo()'; it is about do you understand fundamentals, are you a problem solver who can go beyond what is handed to you and make happen what needs to happen. I completely agree with you gentleman.Just coming up with ready made answers for anticipated questions should not be the right criterion to select a candidate.I personally believe we must think out of box to figure out what an experienced resource is bringing in as a value add in new environment.There is always an X factor which you may require to investigate in order to hire right candidate. The purpose of this website is just to acquaint and summarize what one may face during a a specific language/technology interview which is just a precursor to your dream job. nice blog, even I am working on similar sort of blog. have a look when you get time. A complete set of faqs at a single place is what I wished for and I got more than what I asked for. Even though most of the answers are backed up by the images from the BlackBook, this had been a very fair experience to go thru rather than the book. Thanks for taking time and sharing the info. Very interesting blog! Very imformative, indeed! Please take the time to visit my place and don't forget to leave your mark behind! Have a great weekend! visit http://www.javacircuit.blogspot.com to learn java perfectly !!! hey nice blog dude..keep it going.. Very good information. One should always be prepared when going for an interview. Excellent collection for java Professionals!!! Of-course its a nice ,cool , handy , good , informative , interesting blog and so on but i would be happy if you include some of the logical program codes which are asked in the in the job interviews recently , as you know theses days they don't look too much for programming side rather more emphasis is on logic building.. These are great questions! Thanks for sharing.. Thanks for sharing so many Java resources.I found them quite useful for Java interview preparation. and getting deep into concept. Brilliant post. Thanks for sharing valuable knowledge with us. Many organizations are hiring under core java. The job seekers are searched for where they can get better questions and answers. I found your site. I hope it will very helpful for me and all. Thanks for sharing this great information. Some of the good questions I have seen, here is some other good questions quite interesting Top 20 core java interview questions you may find useful. I really do agree, it is worth spending some time preparing an interview... because even if you are the best developer ever, some questions are not related to the day-to-day job. I also found an interesting list of questions on EFA - Interview. 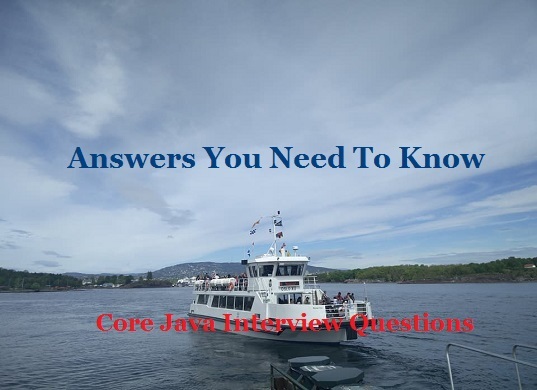 I found these Core Java Interview Questions rather helpful, thank you very much. Thanks for the marvelous posting! I really enjoyed reading it, you're a great author.I will ensure that I bookmark your blog and will often come back from now on. I want to encourage you continue your great job, have a nice day! thanks for this information java main method . Super stuff. Keep it up.